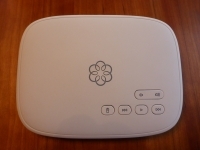 The Ooma home Telo Hub is the heart of this system, so we will start with it. 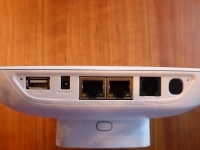 The white unit has the look of an antenna-less Wi-Fi router and is roughly the same size. 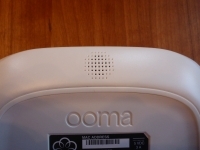 On the top there is an Ooma logo that doubles as an LED indicator for system status. Along the bottom right corner you'll find several buttons to control volume and other playback features for the voice mail. Along the back edge you'll find your IO ports. There is a USB port, power input, (2) Ethernet ports, a phone jack, and page key. Also along the back edge, but at the bottom of the device, is the speaker for announcements. Overall it is a pretty simple device to connect and set up. The Ooma home Motion Sensor is also white and fairly large. With the included stand it measures 5" x 2 ½" x 2". This is quite a bit bigger than other motion sensors I have with the exception of a Bosch Pet Immune sensor. The stand is easily removable by following the instructions printed on the device. You simply press a tab and slide the mount down. The unit appears to be very stable with the stand in place but should you need to mount it elsewhere the back plate does have holes for securely mounting it. You can also use double stick tape and if you look closely at the picture below they have also angled the sides of the mounting plate in case you need to mount this in a corner. One really thoughtful feature of this sensor is the magnetic mount of the sensor to the back plate. This makes future replacement of the CR123A battery super easy. 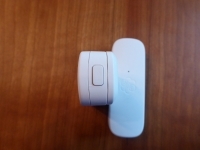 Ooma home window/door sensors are also white and again fairly large. These are significantly larger than the Iris Gen. 1 sensors which are on the big side themselves. They measure in at 3 1/4" x 1 1/8" x ¾". The advantage to this size is the Ooma sensor uses standard AAA batteries unlike the Iris sensors that use a CR2 battery. So if you don't care about the size; these should cost you less to operate over the years to come. Again the device was well thought out; at one end you'll find a little switch. Depressing this allows you to remove the switch from the back plate that gets permanently mounted. This allows you to take the switch somewhere to replace the batteries. This is significantly easier than trying to replace a battery in a hard to reach location. And the included spacers make it easier to find suitable mounting locations and properly align the magnet to the sensor.